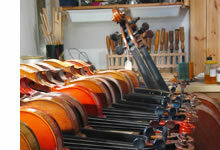 "..grew up ... around the violin.."
Poole Violins was started by violin maker and repairer Mark O'Brien in 2010. 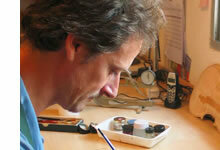 Mark grew up in the Poole and Bournemouth area around the violin, both his parents being professional violinists. He went to the London Guildhall University to study violin making, and then joined the making and repair course at the Newark School of Violin Making, leaving with a distinction. After college he was offered a position at J.P.Guivier and Co. Ltd. in London’s west-end, the longest established violin dealers in the capital, where he benefited from many years of expert direction in their well-known and respected workshops. Mark set up Poole Violins after he and his family moved back to the Dorset area from Spain where he ran a successful workshop just outside the city of Valencia. Through Poole Violins, Mark is proud to be able to offer the string community of the area and beyond an expert service for players of all levels.